Going into this film I must admit that despite hearing good things, I had zero expectations. I must say I was pleasantly surprised by this Minnelli musical because it was a deft and often beautiful production. Channeling the same vein as Singin’ in the Rain and The Red Shoes, this film is a spectacle in its own right. You have headliners Fred Astaire and Cyd Charisse matched nicely. Oscar Levant and Nanette Fabray act as wonderful comic relief as the wedded playwrights, who also do some song and dance. Finally, there is Jack Buchanan, as the stereotypical theater maestro Jeffrey Cordova. Following an initial misunderstanding, the leads finally clear up their differences and push forward to make The Band Wagon the smash hit it is destined to be. However, Cordova has turned it into a modern-day Faust and when opening night comes the after party is more like a wake. All the players seem strangely nonchalant and then the idea hits! Make The Band Wagon over again and take it on the road. Everyone in the cast from the bottom up is excited for the second chance with Hunter at the helm. All that is except choreographer Paul Byrd. Despite Paul’s departure, Gaby is still enthusiastic and they turn the Band Wagon into the production that the Martons had envisioned from the beginning. Tony is a success once again, and he receives a round of rousing cheers from his new family. Gaby speaks for all of them (and herself) when she says they love him and believe that the show will go forever. I immensely enjoyed many of the numbers including: “Shine Your Shoes,” with the camera following Astaire as he frolics around at an arcade with a shoeshine man. The extras, the exquisite set, and Astaire himself all culminate in an often comical and always upbeat number that is great fun to watch. Then, of course, there is the ever memorable “That’s Entertainment,” which even spawned a series of musical documentaries, and for good reason. The words and melody are quite a catchy ode to the stage. Perhaps the most beautiful sequence in the film involves Astaire and Charisse in “Dancing in the Dark” where they positively glide through Central Park together in perfect cadence. They move not as individuals but as a poetic unit in motion. It is fitting that it was their first dance together in the film. For never seeing Cyd Charisse in another film (except briefly in Singin’ in the Rain), I must say that I really did enjoy her performance opposite the always likable Fred Astaire. Furthermore, I am in complete agreement with her character, “I don’t think a dancer should smoke,” it’s bad for the lungs. The cameo of Ava Garner was an odd surprise (especially due to her resemblance to Charisse). Furthermore, I never thought it could exist, but this film proved me wrong. There is such a thing as a film-noir musical! That’s The Band Wagon for you folks! That’s Entertainment! 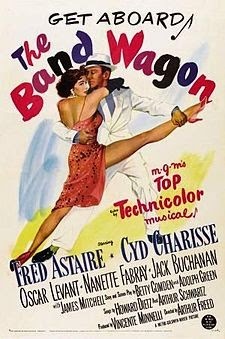 This entry was posted in 1950s, Comedy, Musical and tagged Cyd Charisse, Fred Astaire, Great Film, Nanette Fabray, Oscar Levant, Review, Vincente Minneli by 4StarFilmFan. Bookmark the permalink.